Giveaway is now closed and the winner has been contacted. If this is your first visit to my blog, let me share a little bit about me and where I began my love of quilting. Not one picture of the process of making my purse! Yup, thats how I roll. I dive in and think only about the task at hand, giving no thought of what is up ahead. Not only that, but I procrastinated until the last possible moment to make my coin purse. That is typical for me, too. Is this not seriously cute?! I was a wee bit intimidated about making it, however, I had no reason to be. Once I sat down with the pattern and began, it went together very well. I love that it is fully lined (which I neglected to take a picture of). You will need to purchase the PDF pattern here. A bit of fusible fleece, a handle, some thread, all of which you can purchase @Quilt Taffy and, of course, fabric. What do you think? Would you like to make one, too? 3 - And enough fusible fleece for your project. To enter, simply leave a comment and it's open to anyone, anywhere. =) I won't complain if you decide to become a follower. ;-) That's it. I will pick a winner with Random.org on the last day of the hop, which is Nov. 13th. If you are a no-reply blogger, please leave your email address in the comment so I can contact you. Pretty in Pink - excellent name for your cute little purse. Thank you for sharing and for the lovely give away. Absolutely love your purse! I'm also a follower :) thanks for the giveaway! Love your coin purse and the quilting really makes it extra special! Thank you for sharing and the great giveaway. Oooh its lovely - I love the materials you have used. I didnt join in this hop so am just looking what everyone has made and now wishing I had! What a cute purse! The fabric is adorable and I love the lines you sewed on it. I only made one for the bloghop so far, but I find these great ideas on this first day and I'm tempted to sew a few more! Beautiful, the quilting really adds to it - I think they are definitely addictive! Very Cute, Amy, and so is your little sheep! Really love the colour of this one. Very nice job. Wonderful coin bag. They would make great gifts. Love it! Great colours! Thanks for the chance to win! Love your purse! I've really got to learn to make these. My mind is spinning with all the creativity! Now you just added to the spinning! Love the quilting you added! Thanks for sharing and the chance to win. BTW - I'm a follower!! Love your quilted coin purse! Great idea! So great that you quilted your purse. It turned out cute. Very sweet. I love that you quilted the sides. I will have to remember that. So cute! How did you quilt it? I'm trying to imagine where that would go in the steps and can't quite picture it. I love your little purse! I made a couple, too, although I'm not in the Hop. This is such a fun project! Very cute purse, love the quilting. Wow! This is so cute! My favorite one...I'm not in the Hop (needed some time off from Hops)...now I wish I was. Thanks! That is just adorable and practical, too. Thank you for having the link to the pattern and to the source for the 3 inch frames. Love the fabric you used in your little coin purse. This pattern does look intimidating but I am up for the challenge. This would make really cute gifts. Thanks for the chance to win the pattern. Adorable, Amy! I'm a new follower! You did a great job! It's precious! I always forget to take pictures along the way too. I can see how making these could become addictive. Love your fabric choice & your quilting. And I want too see more of that pink tree! That is so cute, and I love the quilted look! I love that purse! Great stuff. I think you proceeded like I would have done...forget everything else in the way! Great job! Oh, your purse is very sweet. thanks for sharing. and thanks for a chance to win your giveaway. Fabulous purse! I'd love to try making one! The cross hatching is perfect! You did a great job. Your purse is super cute and deserving of being chosen as one of Madam Samm's favorites today. Good luck with learning more about your great quilting machine. Love the purse! My day is the last one and I am now officially scared! Great job on the coin purse. I like that you quilted it. Nancy P.
I love the quilting on it and the fabric is beautiful! Very nice! Hi!!! It is very pretty!!! Love the close up of the quilting!!! Looks wonderful!!! Well since everyone is saying it is easier to make than it looks...I just might give it a try!!!! Thanks for the fun!!! I like your coin purse. Great job. I am a follower of yours. Now I am off to see what everyone else did. How very cute!! I love that you quilted the side pannels, it gives it that little something extra. Thanks for sharing. Sew Cute! Love the stitching you did. Really sets it off. Even though you waited until the last minute, your coin purse is ADORABLE!!! Love it! wow! i love the cross hatching on your little coin purse, so dawgone cute! and, what a sweet giveaway, please count me in! Your color selection is perfect...I love small purses. Your little purse is lovely. Thanks for the chance on you wonderful giveaway. What a darling purse. And you won for the day. Congratulations. Thank you so much for sharing. I love the stitching details! I will gladly follow you and get to know you! You did a great job, love that fabric and love that you quilted it! Please don't enter me for the giveaway, I'm part of the hop! 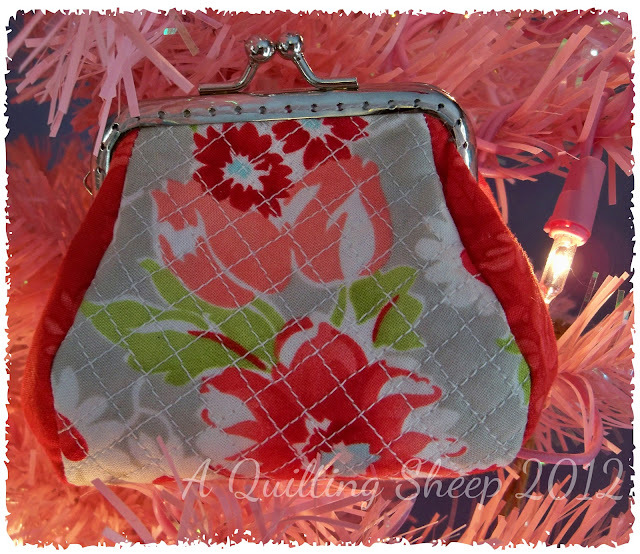 I really like the quilting you did on this cute little purse! This is adorable! Thanks for sahring your creation and a little bit about yourself! What a great idea to crosshatch the front and back. I will certainly try that on the next one I make! 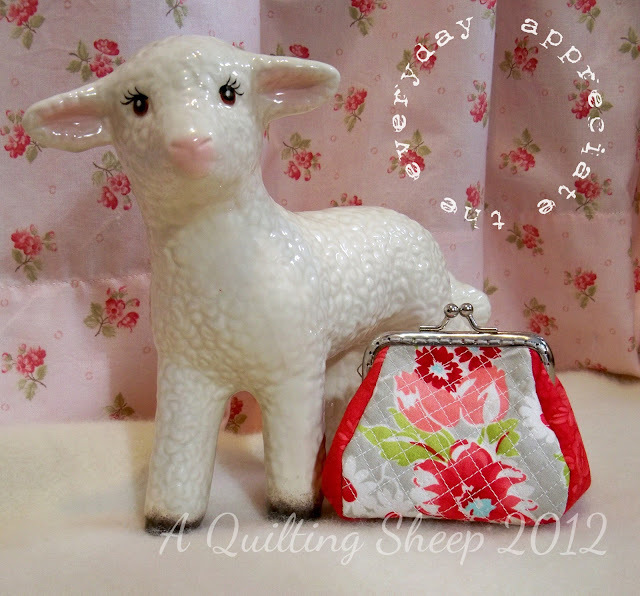 Amy, the quilting is perfect, what a darling little purse! I love your little coin purse. I especially like that you "quilted" it! Ok, this is seriously the cutest one I have seen and I love that you quilted it! very very cute! would love to get the frame and try this for me!! Oh Amy, that is just darling! I am in the hop so please do not include me in your generous giveaway. Love your quilted purse! These will make wonderful gifts! Thanks for the great giveaway! Wonderful purse! Very nice with the quilting. You did a great job, it's a lovely little coin purse! Thanks for sharing! Such an awesome little purse, well worth the waiting for! As another procrastinator I completely understand! Red is my favorite color! I love what you have done with it. Thanks for the chance to win. Your little coin purse is lovely , you did fantastic job .Thanks for the chance to win , and I am a new follower ! Your site is one of my favorite. I love the quilting you did on the coin purse. It is so elegant! I may have to copy this. Thanks for all your creativity and for sharing. I had no idea you have only been quilting for 5 yrs! I will probably make this coin purse as a christmas gift if I win. super cute! I am a follower and like your purse. - the quilting really added to the piazz. Your purse is adorable,I love it.You did great job!! Darling coin purse. Thank you for the chance to win. Your purse is very pretty! I love the fabric and the quilting. Thanks for a chance in your giveaway. We well all have the bug to make these coin purses after seeing so many nice ones. Love your little purse. I really like that it is quilted. lovely quilted purse, thanks for sharing! lovely purse, thanks for sharing. Rosemary B here: cutest purse ever! Hi Amy, It is adorable...I think these would make great gifts! Thank you for sharing your testimony also! Awesome coin purse! I especially like the added stitching on the front panel. Thank you for sharing. Love the story of how you began to sew. It sounds like it has become a passion. Cute coin purse. Love how you quilted the middle part. Great job! I like the cross hatch quilting on your coin purse. It is a great look. Thanks for sharing. The quilting on your purse is wonderful! I love how it turned out. Great job! Very cute purse and the colors/fabrics are wonderful. I assume that you quilted the front fabric; it adds pizzazz! 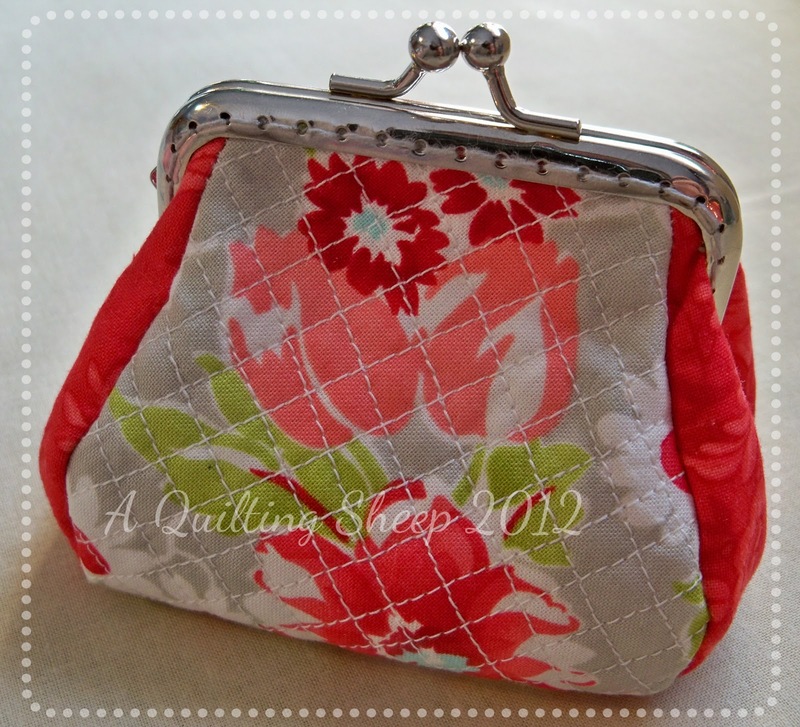 What a pretty coin purse you made, I love the quilting you did on yours. Love the colour and love the quilting, great job. I now see a reason to make another, I never thought to quilt the little rascal and yours is so cute. Thanks for sharing. I love your take on it and the quilting just makes it POP! Lovely! I like your purse. I may just have to try one myself, as you all are making them sound so managable! I like the fact that the front of your purse has quilting. Very cute. As I'm also in the hop, I already have the pattern, so don't enter me in the draw, but I did want to comment and say what a pretty purse you made. Super cute little coin purse! Love the quilting on your sweet purse. Thanks for sharing and congrats on being one of the chosen. The quilting on your coin purse is wonderful! What a sweet purse and a great giveaway! Thanks for sharing with us all. Pretty in pink and perfect! Love your coin purse, Amy. The quilting on the front panel adds a lovely touch of texture, too. Well done! Love your little purses! Thanks for sharing. I love your fabric choice for your little bag. Very pretty! I would love to make that coin purse! Thanks for the opportunity! Well, that is just a perfect to use fusible fleece and quilt it! Sew cute! a quilted coin purse--that's the first one I've seen and I love it! What a great idea! awhile and have some catching up to do. Love all your sweet little lambs. Cute purse. I'd love to try something new. Thank you for the opportunity. Such a sweet purse - love your quilting! Cutest purse ever - and I LOVE the quilting!!! Looking at ll these coin purses makes me want to make one...so need the pattern! Yours is sooooo cute! What a cute purse. Thanks for leaving the contest open long enough for me to enter. Thanks to Betsy's Closet in Stitches, I found you...a kindred spirit.